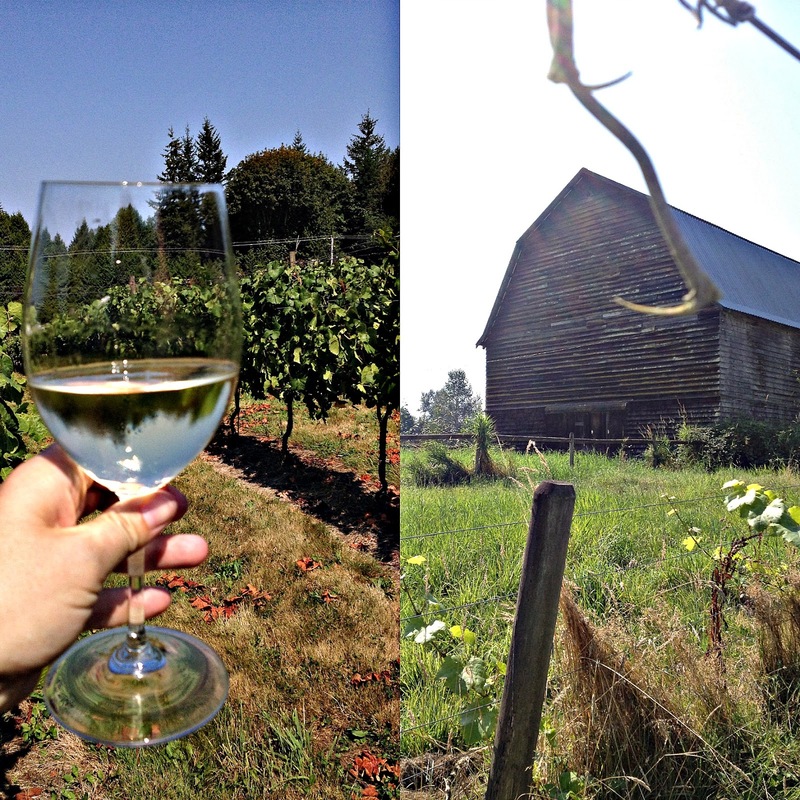 Last weekend we had the pleasure of heading out to the country- with friends- for a yummy picnic and some wine- our destination was Township 7 Wines in Langley. 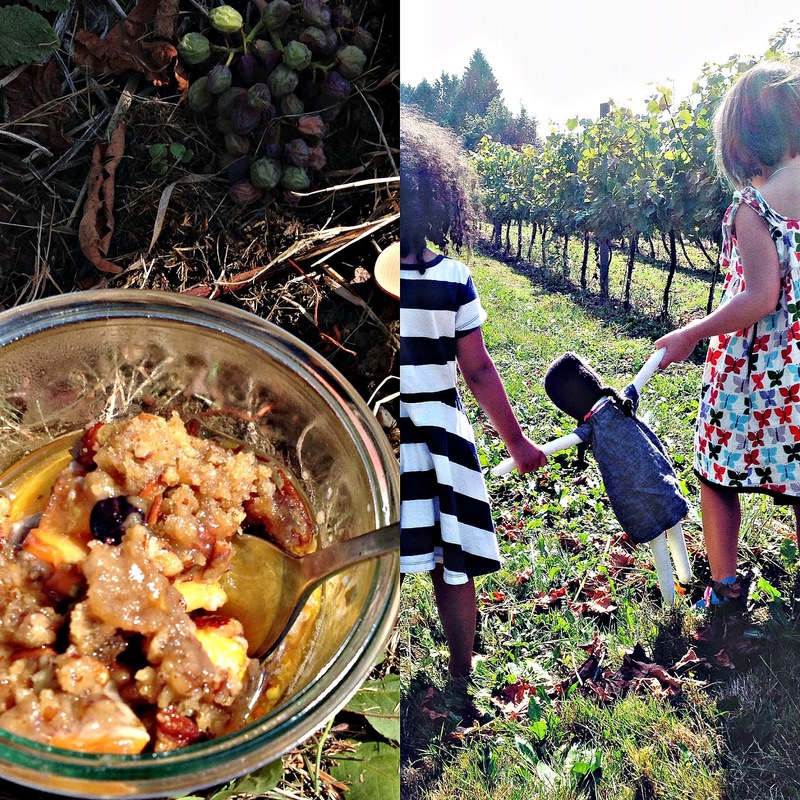 While this recipe isn't strictly a cake it is cake like so I thought it would still apply- Peach Crisp in jars is the perfect dessert for a picnic in a vineyard- its also the perfect end of summer treat! Place all dry ingredients in a bowl- cut in cubed butter with a pastry cutter until pastry is grainy- set topping aside. Mix peaches and blueberries in a large casserole dish- make sure the fruit is evenly placed in the bottom on the dish- sprinkle topping over top of fruit and shake the dish so the topping settles down into the fruit. Friends it is Friday again- it's been quite a week- full of cousins visiting- swimming and sunshine- going into the long weekend we are going to take it easy- be quiet. Things feel a bit flat with the uncertainty of the school situation in British Columbia- but to all of our teacher friends we stand with you- take it to the mattress! Much love Friends- Happy Friday! This past Saturday found us headed up the Sea to Sky Highway once again- into the mountains that make our hearts happy and our feet itch to get moving. 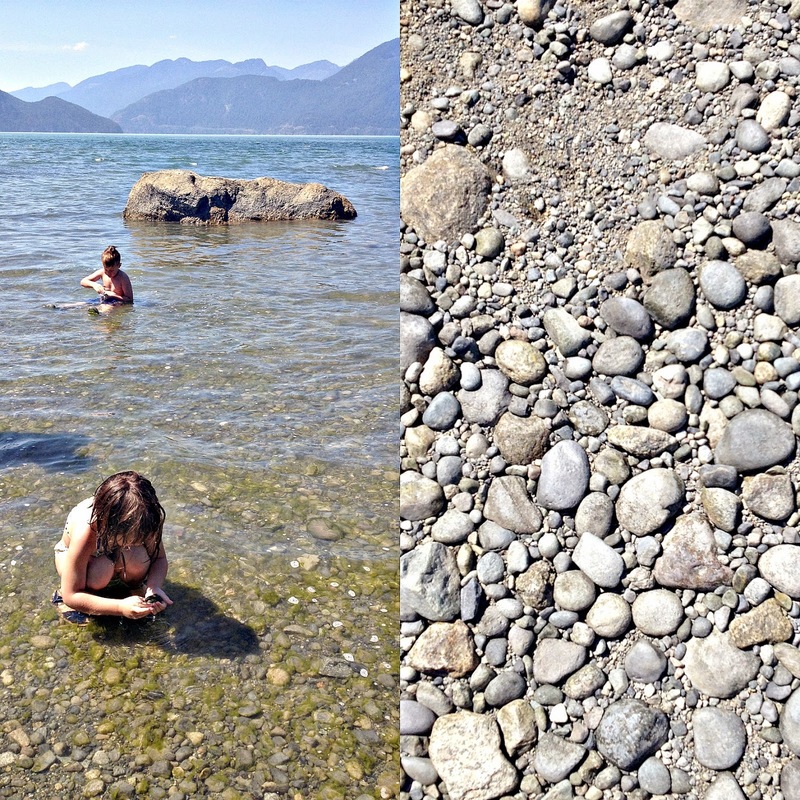 We sped past our favourite camping spot- Porteau Cove- made a quick stop for lunch provisions in Squamish and continued up into the hills towards Brandywine Falls Provincial Park. Just off the side of the highway lies an unassuming looking rest stop and picnic area- however the scores of tourist busses are a sure sign something spectacular is near by. The falls themselves are a short 300 meter stroll from the parking lot and are sure to impress- hence all the tour busses- folks hopping off- taking pictures of the falls and hopping back on their air conditioned luxury coaches- they have no idea what they are actually missing out on! While the falls are a must see- at 70 meters tall how could they fail to impress- the real magic lies deeper in the forest. A number of hiking and biking trails were recently added and the park expanded to over triple it's size to include habitat for a previously endangered frog. 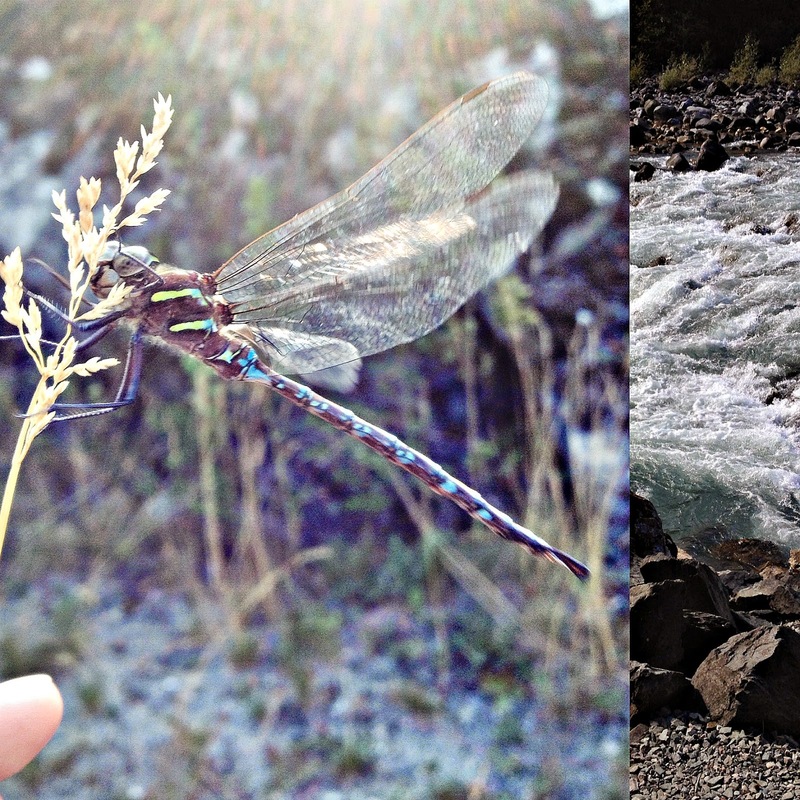 Pick and number of trails and you will not fail to be disappointed- away from the crowds we headed out through lush forest towards the Calcheak Suspension Bridge along the Cheakamus River. Pausing at the look out and gazing down the valley towards Daisy Lake was positively vertigo inducing- bringing me back to the reality that we are all so tiny and in the vastness of the mountains and the world in general- we are really just specks on the globe- humbling. The wind blew hot and dry up on the ridge- bringing to mind the Thunderbird who reigns the skies flapping his wings- as we continued on up into the power line cut the sun showed no hint of knowing it's the end of summer. While we didn't make it all the way to the suspension bridge the Littles did really well- it was really hot and they just weren't digging a forced march- so as soon as hiking stopped being fun we just turned around and headed back to the van. Both Littles collected their fair share of rocks on the hike- immediately noticing the chunks of lava along the side of the trails- much speculation about weather or not we were on an old volcano was bandied about. The were right- we were all interested to learn that the valley walls are compromised of at least four basaltic lava flows-almost 34,000 years old- amazing! With the hot sun beating down on our shoulders and the warm summer winds blowing down the valley it's hard to believe summer is coming to a close. Each time we head out in the sunshine from now on is like a gift- we can never be too sure when the rains will return. 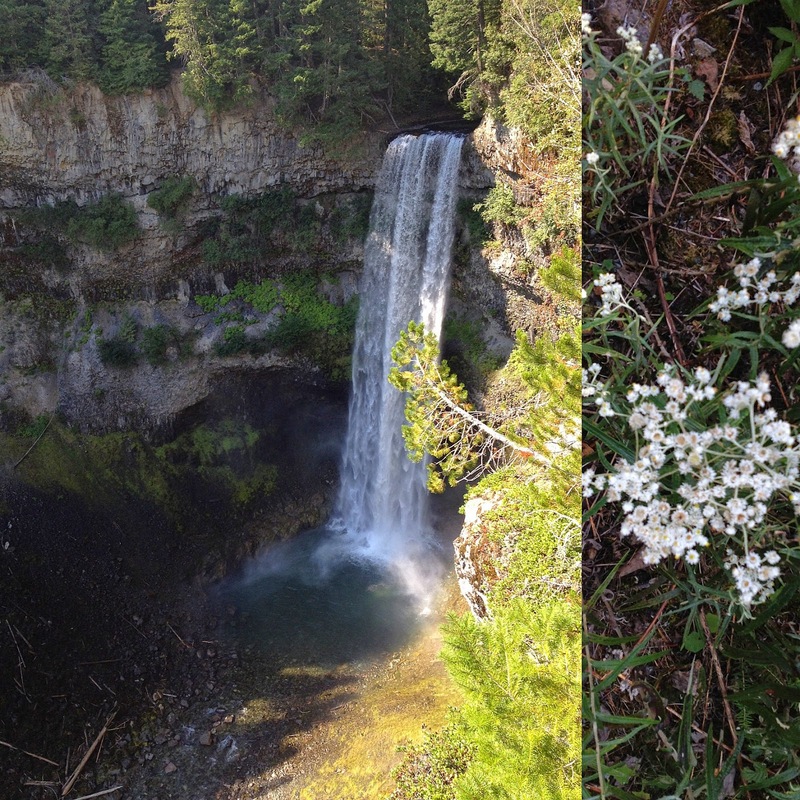 This hike was such a treat- so much of this area is unexplored by our family yet- so many hikes so little time! 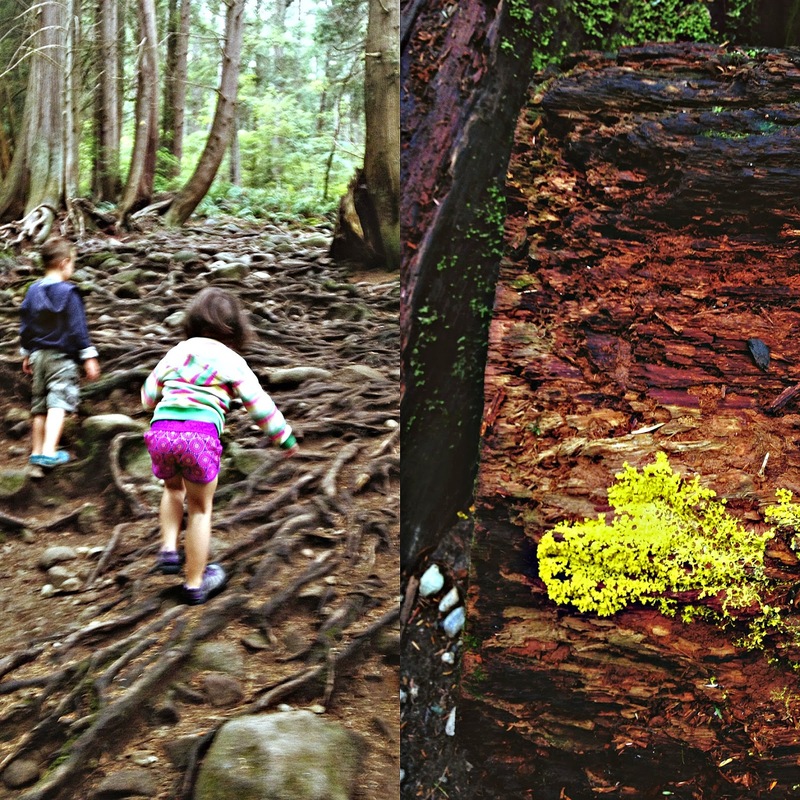 and a sterner sense of justice than we do"
This weekend dawned slightly cool with low slung clouds- beach plans were quickly abandoned and it was decided that we needed to head out on a hike that has long been on our list- Quarry Rock in Deep Cove. 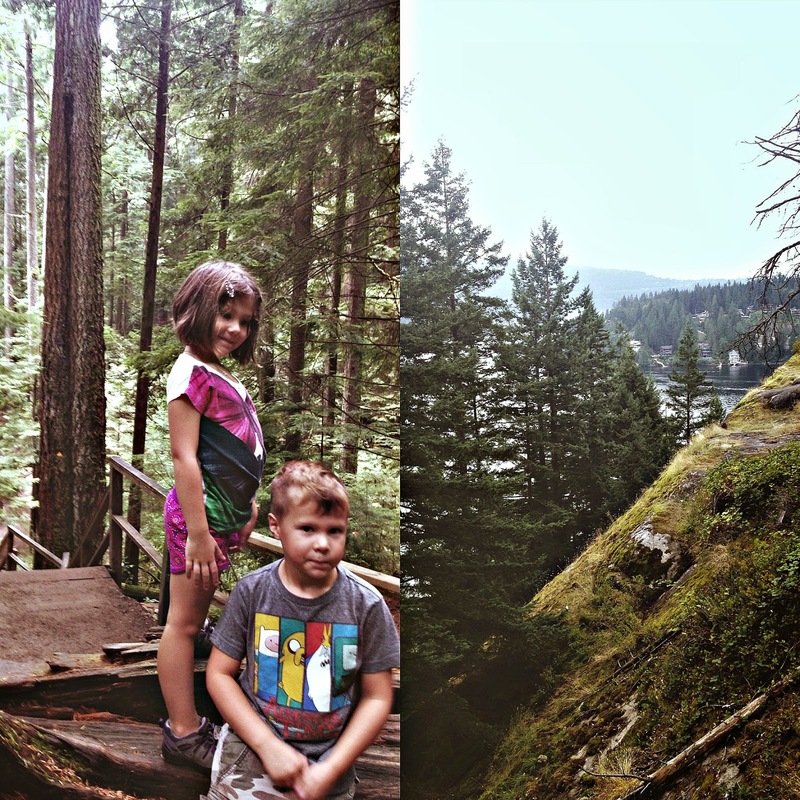 The Littles are finally old enough to handle the steep climb up and back- agile enough to manoeuvre stairs, rocks and roots- this is a hike not for the faint of heart nor those with poor footwear. After procuring a parking spot- conveniently near Honey's Donuts we made our way to the trail head of the Baden Powell trail- located just past the parking lot of Panorama Park- on the other side of the road the trail is a bit tricky to find. Once on the trail however the path is clear- there is only one way and that is mostly up! Apparently many other people also thought that a cloudy Saturday in August would be a good day to hike the trail out to Quarry Rock as it was really busy- rarely a quiet moment to be found which is not really my idea of an enjoyable hike. Crowds aside the hike was a great work out with lots of enjoyable scenery as we made our way up and down the ravines. 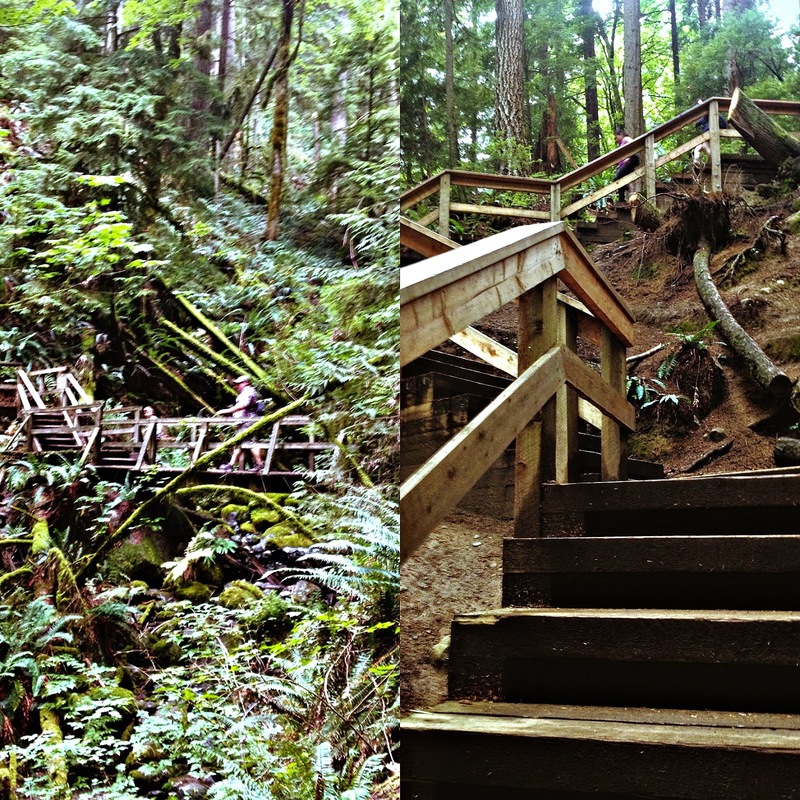 Clearly this very popular hiking trail is well taken care of- multiple sets of stairs and bridges zig zag their way out to the point. Tranquil, trickling streams house what can only be fairy pools- surrounded by ferns and mossy stumps- this is the rainforest at it's best. Once we mad sit out to the end of the trail it was clear to see why this is such a popular hike- the view is spectacular with all of Indian Arm stretching out before you. 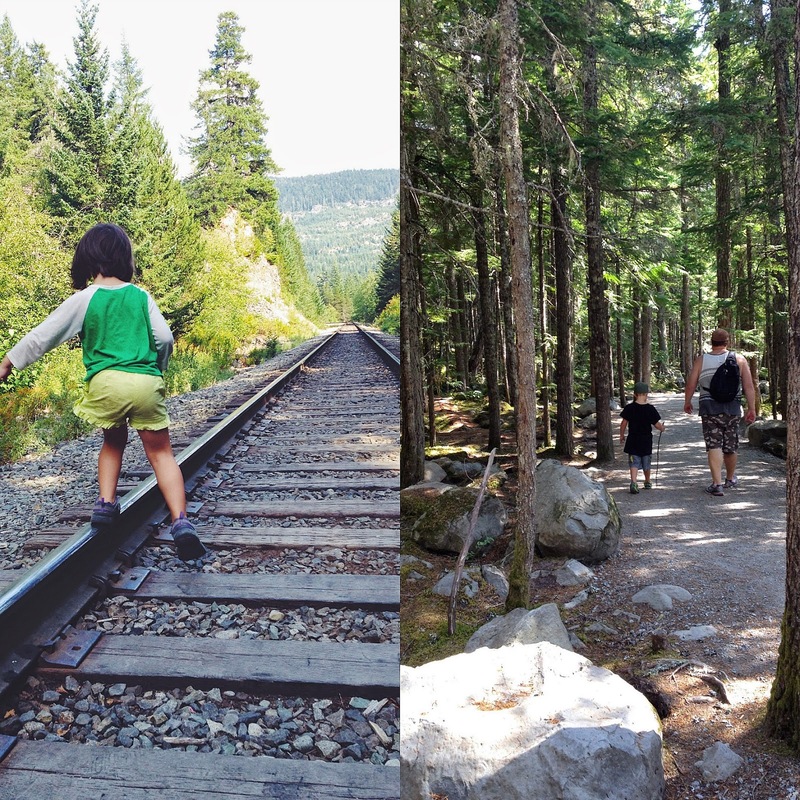 I feel this summer we as a family have really stretched our legs so to speak more than any other year- this can only be attributed to these Littles of our growing and maturing enough to catch the hiking bug. They are interested in the forest and nature- full of questions and needing answers- this has forced both the Mr and I to dig deep into the recess of memory to find which side of trees does moss grow on, what is a fungus, what kind of bird made what kind of noise. I love not only their inquisitive nature but also their adventurous spirit- often wanting to run up the path ahead of us. Of course as with lots of things it sometimes takes some encouragement- some days one or the other doesn't feel like doing the family hike we have all agreed on. With the promise of lots of yummy hiking treats and hot chocolate or a donut at Honey's afterwards both Littles are usually brought around- minutes into the hike most complaining is forgotten as the wild takes over. This summer has brought us officially out of having toddlers and infants- we have big kids now- big kids that can do things like hike up the side of a mountain- while I miss the wee babes they once were I am so excited about the young people they are becoming! With either an electric hand mixer or stationary mixer whip butter- sift in icing sugar by the cup and mix in between- I usually use about 2.5 cups of icing sugar- add vanilla and milk and whip until fluffy. Add desired colouring- Strawberry puree makes and excellent pink while blueberries are the perfect purple! 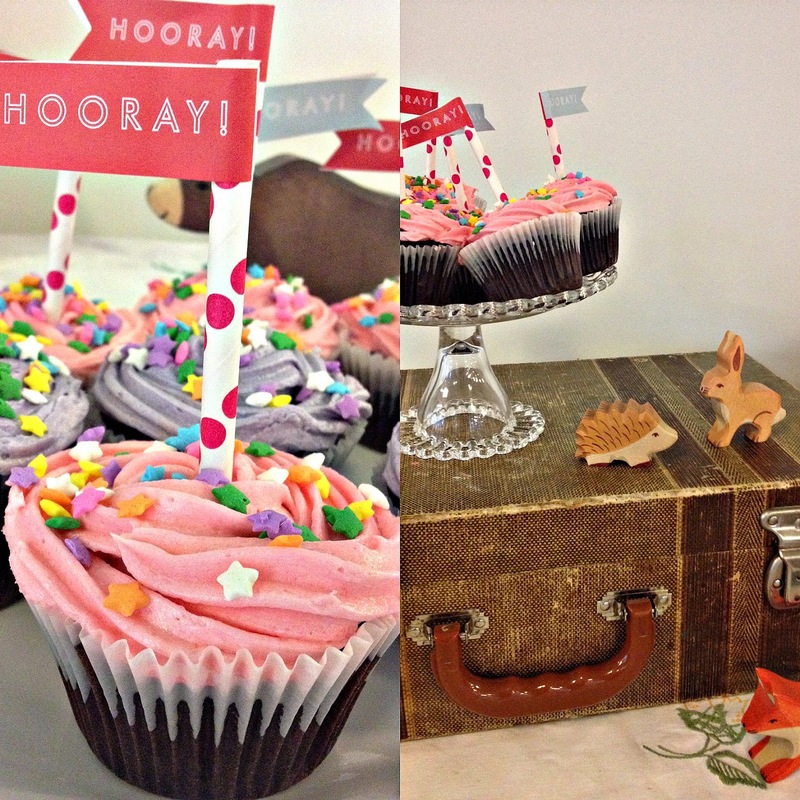 Frost cupcakes- add candles and partay! My girly is five- yesterday was the big day- we spent the day together just her and I- baking cupcakes and frosting them for her party. This was her wish- to learn to frost cupcakes. It feels like just yesterday we were on our way to the hospital to have her and now she is frosting cupcakes! Time flies way too fast these days for my taste- instead of being sad about my baby growing I'm trying my best to celebrate it- to celebrate who she is becoming. This year has been so big for you in so many ways my girl- watching you grow into such a loving and creative person makes me so proud. You have transitioned from a toddler into a true big kid this year- I think a big part of that was being on your own for the first time ever this past year- with big brother in full time school you had the run of the house. 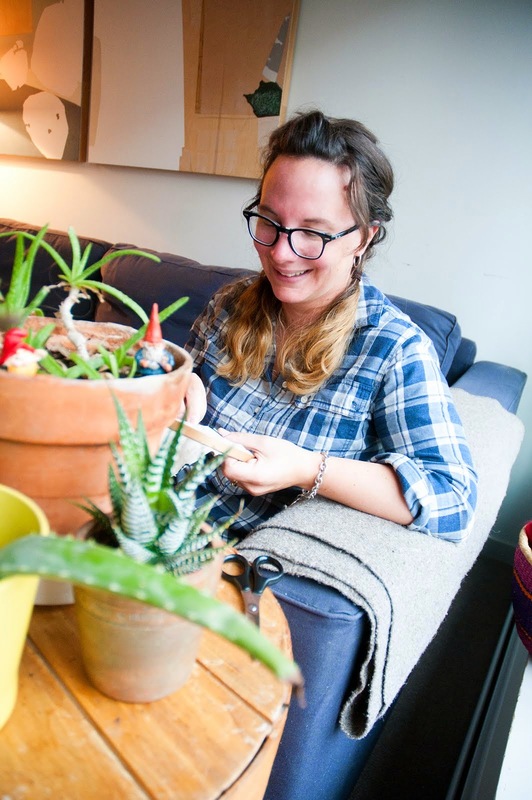 Watching you catch a passion for crafting and art of course makes me ever so happy- but more importantly was seeing you get excited and watching your eyes glow as you figured out how things work- the first time you felted- the first time you quilted. At five you are already a much better drawer than I am- should you chose to be an artist I feel you will quickly surpass me! You love so many things but chiefly among what you love most is animals- you are my animal girl- loving on any fury beast that gets in your path. Riding a horse for the first time this summer was huge for you- in a heart beat I could jump forward years and see you grown and riding like a pro- but like everything I won't push it- it's up to you to decide. Clearly though we are going to have to add a pup or kitty to our family- you ask almost every day and one day I just won't be able to say no to that. Lizards are also up for discussion. The past year has seen you go from a little one who still napped to a big kid who scooters everywhere- if you aren't running you are scooting! To the park to meet your friends- most of whom are boys- you are still friends with the same girls as when you were a wee babe- consistently- I'm so glass as you girls grow you like each other. You learned about losing a friend as she moved across the country- you talk about her as if she still lives up the street. You learned the ins and outs of classroom friendships and how cruel some people can be- friendships can be hard but good ones shouldn't be. So my girl this was a big year for you- a couple of big changes and many tiny changes that no one noticed until they were already a part of you- like your height- how did you get so tall! I am so proud of who you are and who you are growing into- interesting, smart, creative, funny and sometimes totally nuts! You are changing from a baby into a well rounded person- while I do miss those baby cheeks and fluffy hair I treasure every moment spent with you now and always- my coffee date for the last year I will miss you when school goes in! 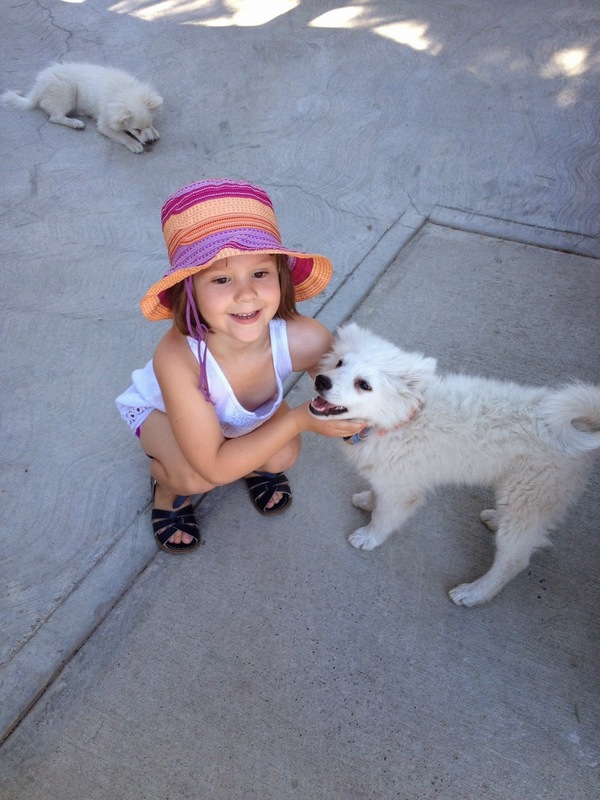 Happy Birthday to my littlest- my heart- my girl- I love you! It's hard to believe that we are actually fully in the month of August- not the beginning but in the thick of August. This weighs heavily on our minds as we seek to enjoy all that the West Coast has to offer while we still have this glorious sunshine- it feels like we are running out of time- sooner or later it will rain. 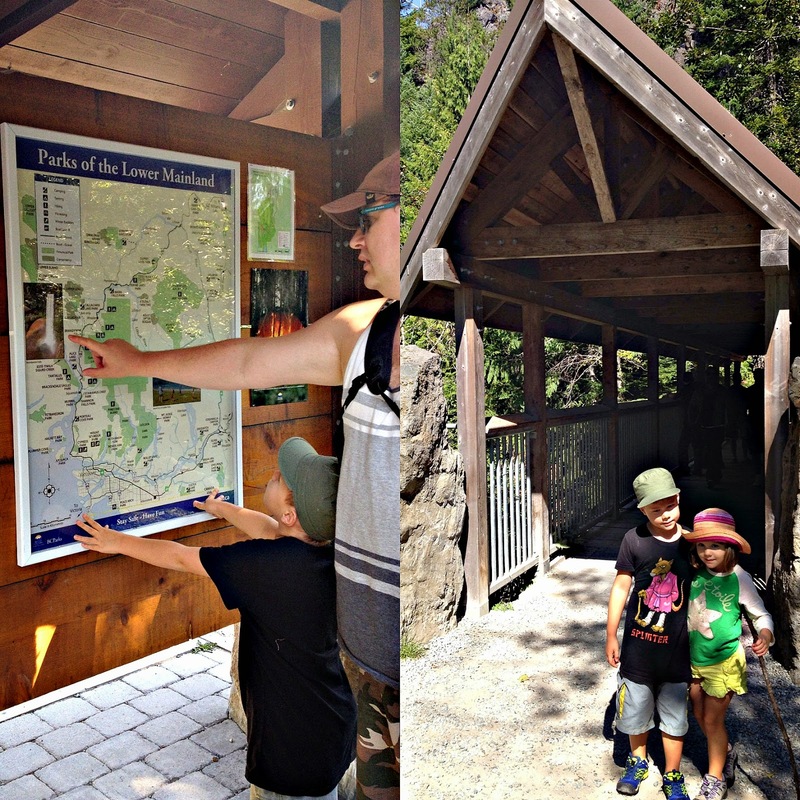 Our weekends have been chock full of exploring new- to us- spots in and around the Lower Mainland- usually this time of year finds us on the road between the Okanagan and the Coast- a long and hard drive that takes a tonne out of our family. This summer we are mixing it up a bit- staying in the city-we are really relaxing and enjoying spending our weekends close to home- with dear friends but most of all with just the four of us. 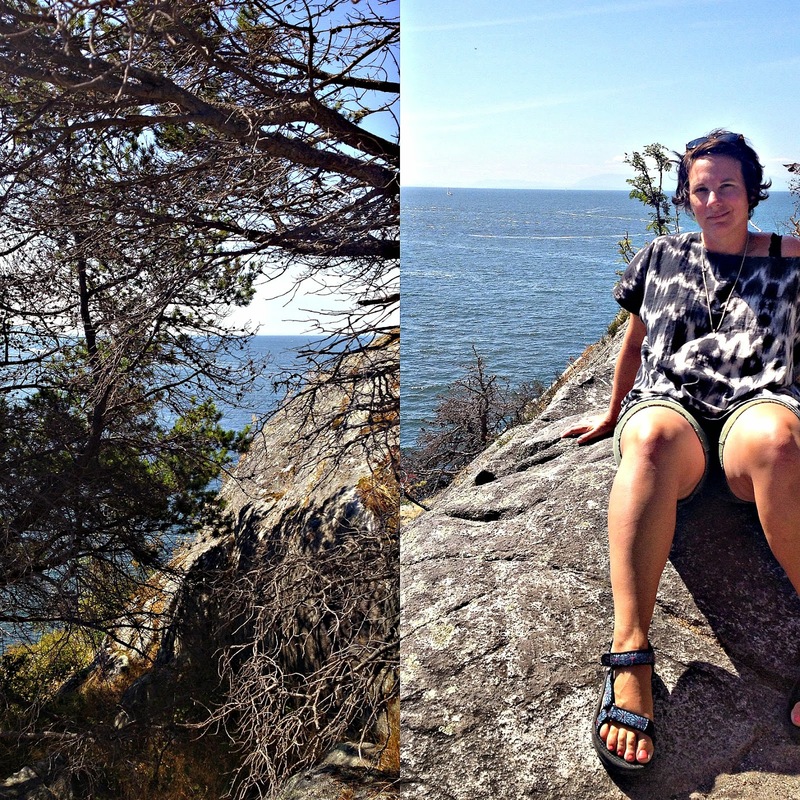 This past weekend we made the short trip up the coast to Whytecliff Park- just south of Horseshoe Bay in West Vancouver- this park has long been on our list of places to visit and we finally made it! 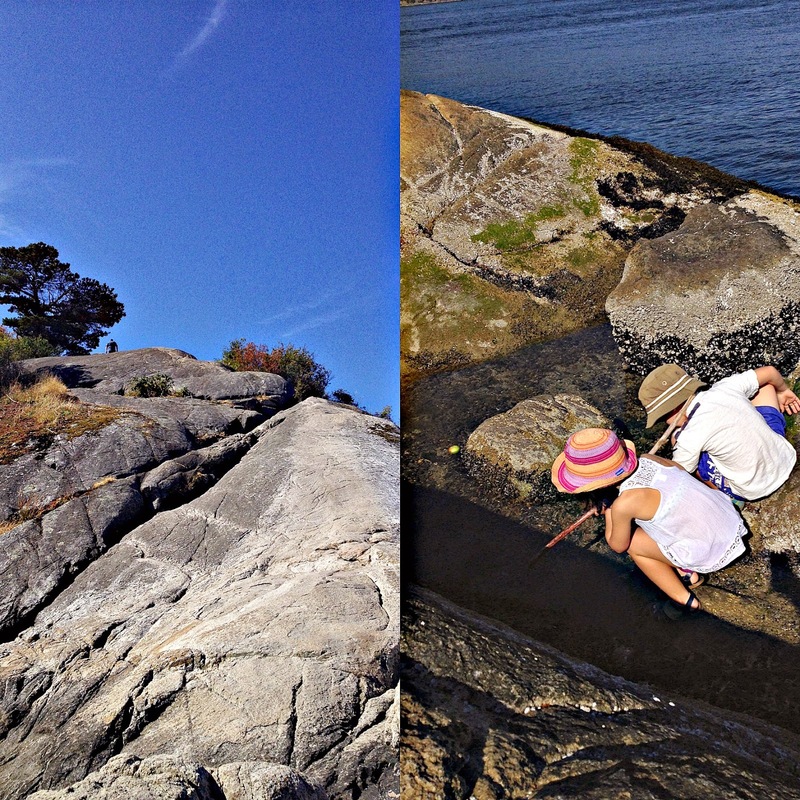 Whytecliff Park was Canada's first marine protected area- chock full of a wide variety of marine life- there are over 200 different species that call this place home. 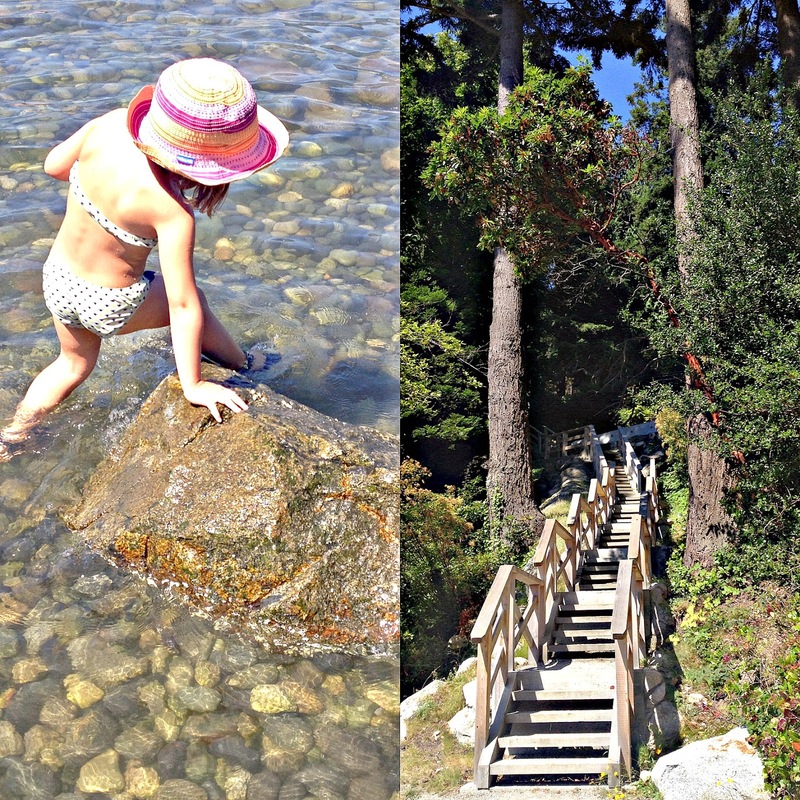 With stunning scenery and a wide variety of activities- from hiking and diving to tennis Whytecliff Park is a very popular spot on a sunshiny Saturday- we made sure to arrive before 10:00 to ensure finding a parking spot! With the tide all the way out we made the hike to the island just off shore easily- the Littles enjoyed watching about a half dozen seals playing and defending their young* just off shore while puttering around in the tidal pools that spot the island. The Mr. and I each made the hike/ climb up the rock- separately so the kids were not left unattended- miraculously I made it up as well as back down on my own- possibly the older I get the less time I have to be afraid of things like heights! The view from the top was stunning and I am so glad I chose to not be afraid. 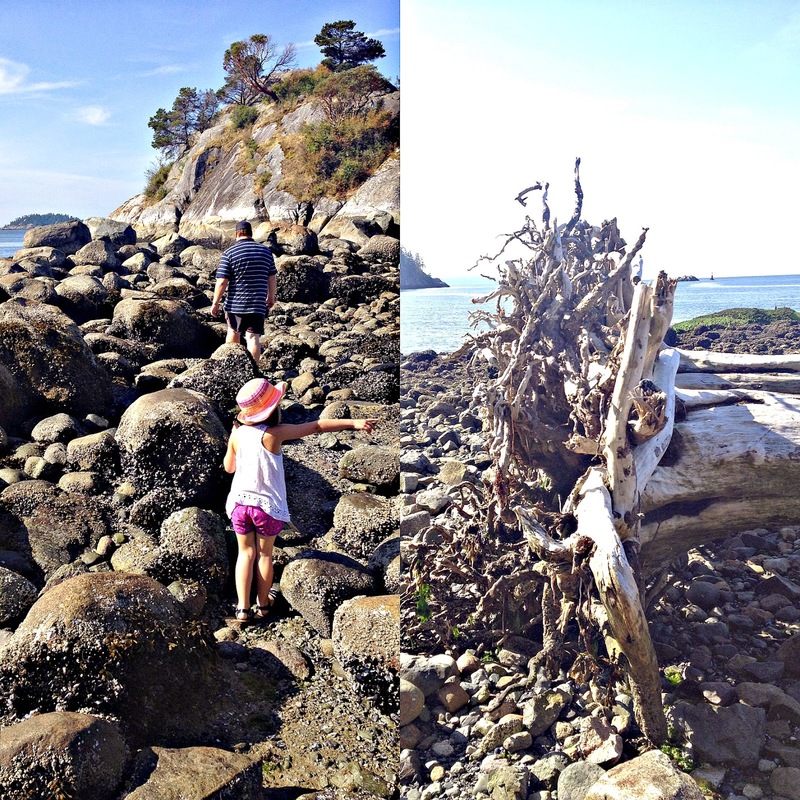 After a quick picnic and frisbee toss we headed to another of the park's many trails and further explored the other side of the cove- again stunning views- cool coastal breezes- sun on our shoulders- only the sound of the waves to be heard. By 2:00 the beach was packed- the island dotted with cliff jumpers- the trails were getting crowded with tourists- finding our little slice of peace and quiet happens early in the day- we knew it was time to move on. With the kind of tiered that only comes from a day spent in the salt air we loaded back into the truck to head home- bodies heavy with contentment. * watching the seals protect their young from larger lone seals is amazing- there was chasing and fighting and lots of seals yelling- it was amazing to watch- not something you would see in an aquarium! 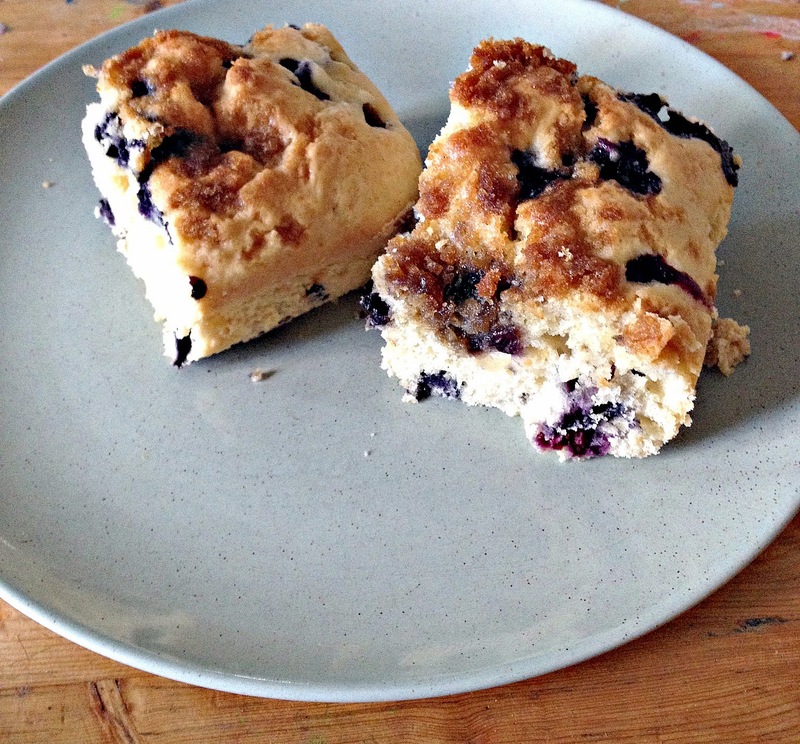 It's blueberry season- rejoice and celebrate peasants! This is one of our favourite times of year and I often feel a bit like a squirrel as I scramble to freeze bags of these delicious berries for the coming months. 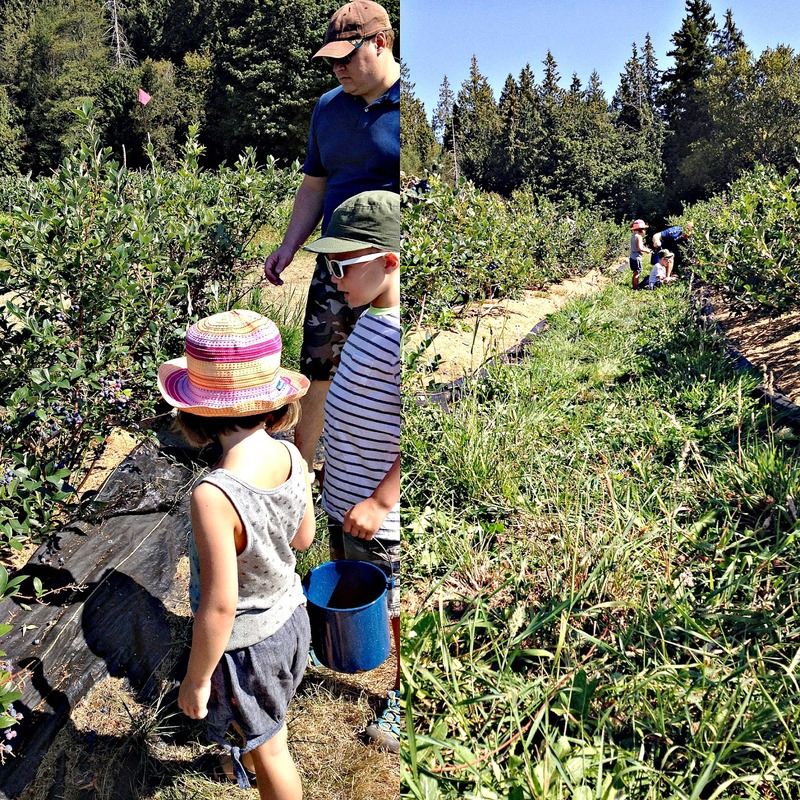 This past weekend the University of British Columbia Farm opened up their no spray fields to the public for U-pick- of course we were among some of the first there when the fields opened! 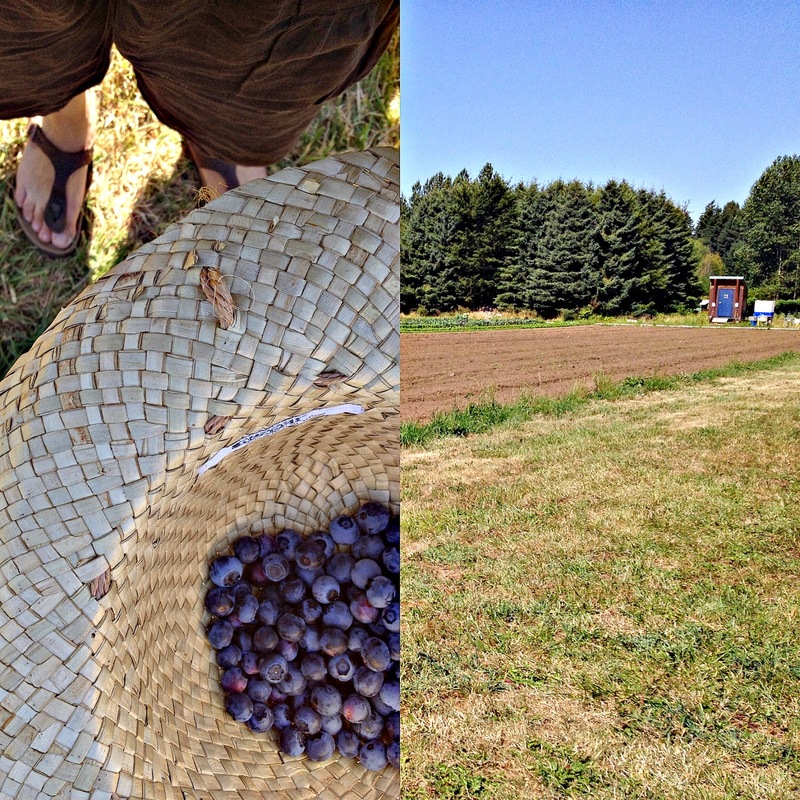 The day was hot- as in very hot- and so the fields were only open until noon- we picked quickly and efficiently- although that was almost unnecessary as the berries practically fell into our buckets! As much as I enjoy buying my produce at the Farmer's Market there is just something so special about being out in the field and gathering berries to tuck away for grey winter days. Of course several were sampled along the way and we all agreed that these are some of the best berries we have ever tasted! 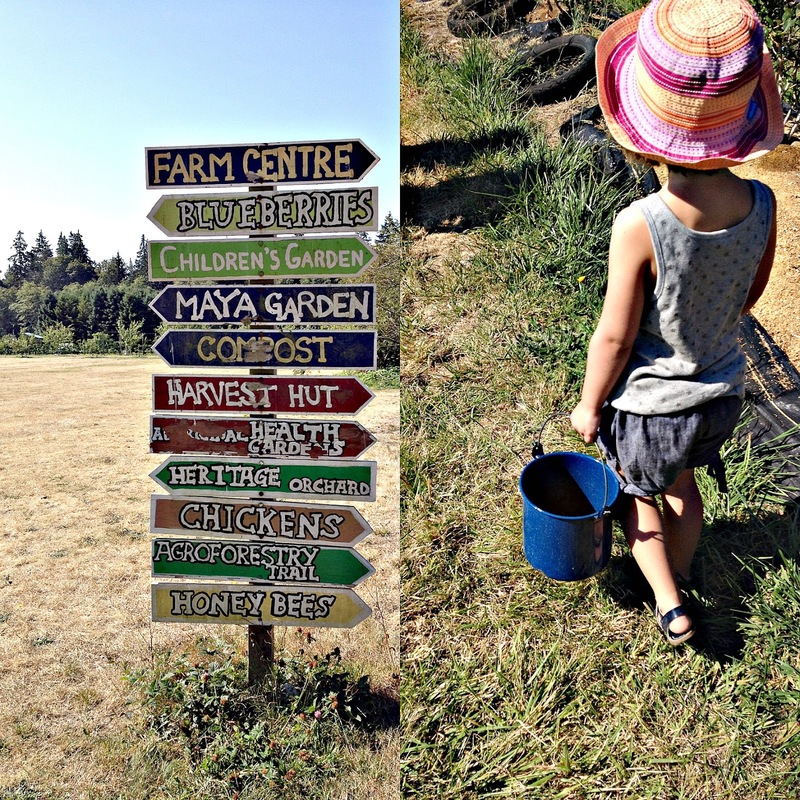 With our buckets and hats full we headed back to the car to drop off our bounty- then onto the UBC's own Farmer's Market we headed. This market is not at all very big but clearly the locals know- as the stalls were crowded- baskets in hand. Pretty much all veg that one could need for the week is to be found here- along with seeds and flowers- wood fired pizza and sugary treats. 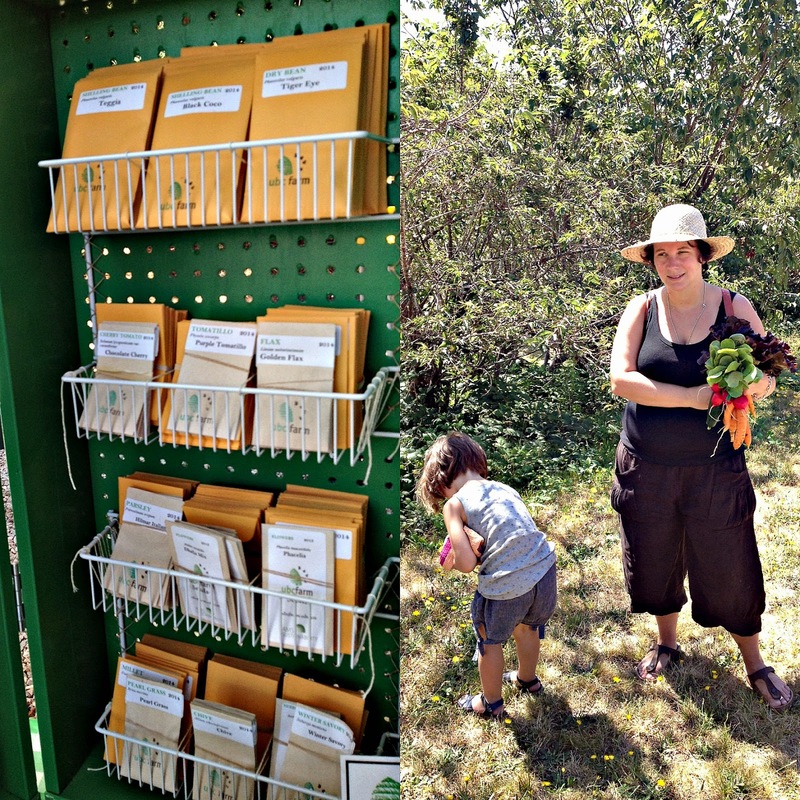 We stocked up on some tasty lettuce, cucumber, carrots and radishes- all grown at the UBC farm. 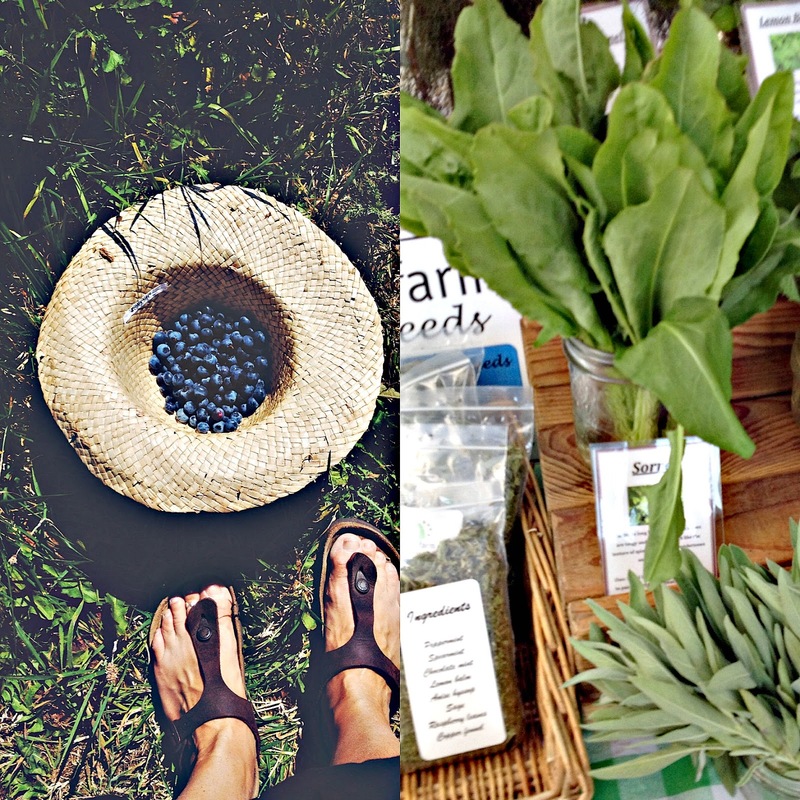 This season of abundance is short so I feel pressed to get in as much as humanly possible- the perfect weather, the berries the produce. Like the sunshine I am soaking these days in- stocking it away for those grey, rainy days of November when the clouds press in. I hear folks complaining about the weather- I can't be bothered- it's hot but for such a short time. Make hey while the sun shines is what Pa* used to say! This past weekend was so full of fun and activity that by the time our bonus day- Monday- hit we were all ready for a little quiet time- so we do what our family does and headed out into nature. Seeking out a spot of peace- to listen for the birds calling and the waves gently lapping at the rocks- this is how we regroup- this is how we relax. With the van fully loaded with snacks from the UBC Farm we headed up the Sea To Sky in search of solitude- which as it turns out on the long weekend is easier said than done. After a few failed attempts at local parks- which were already packed to the gills with no parking available- we headed up the coast a bit further to a place we love so - Porteau Cove. 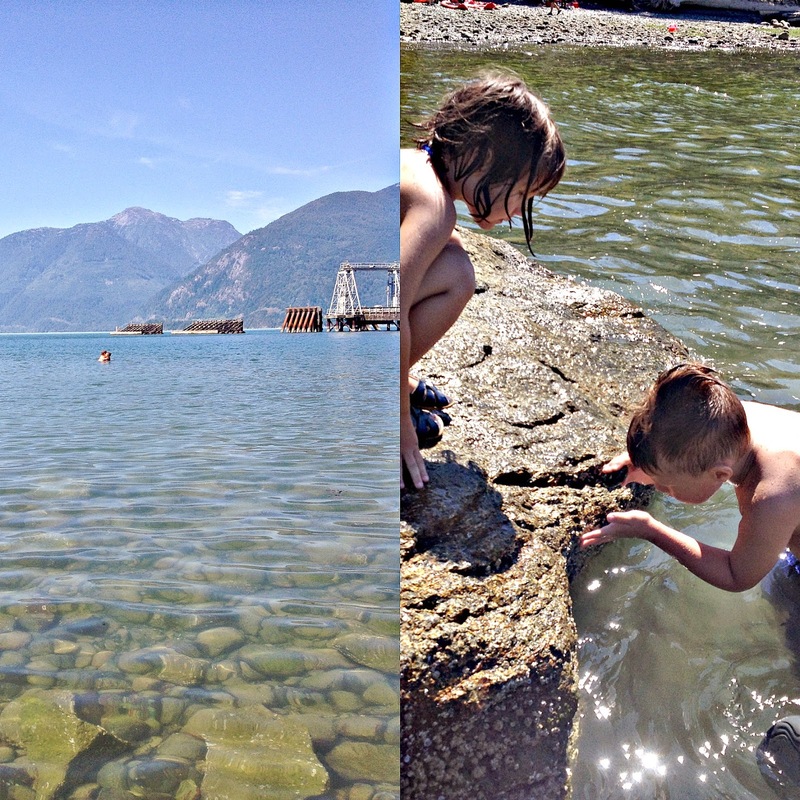 One of our favourite spots to camp Porteau Cove is only a short drive from Vancouver- it never fails to surprise me how only a half an hour out of the city lies this beautiful spot surrounded by mountains- warm shallow water perfect at high tide for swimming with the Littles. The clever wind was blowing warm and soft across the inlet- peaceful and clean- blowing the city off our shoulders. We had every intention of going for a hike this day but the water invited us to stay- linger and enjoy- so the hike did't happen but plenty of exploring and swimming did. The beach was quite crowded as apparently many others had the same idea- so we sought out a quite- shady nook and tucked in. 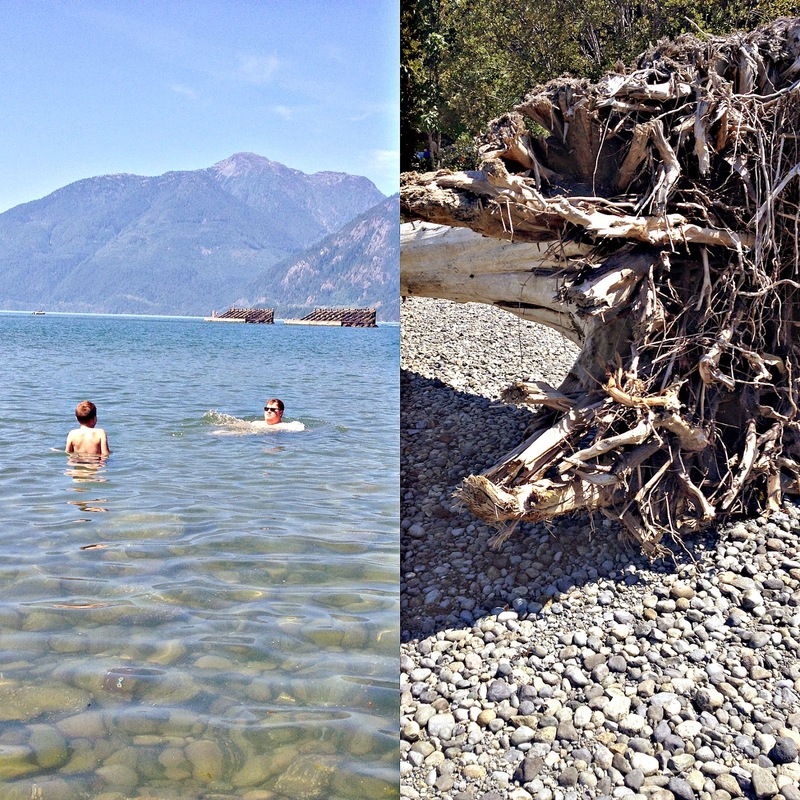 Sitting here on a muggy Monday morning in the city Porteau Cove and yesterday seems about a million miles away- my shoulders are relaxed and I still have salt water in my hair- I know it wasn't a dream. The August long weekend is always a little bitter sweet for me- half way through summer and heading towards back to school- if I blink September will be here. Summer please go on and on and on! 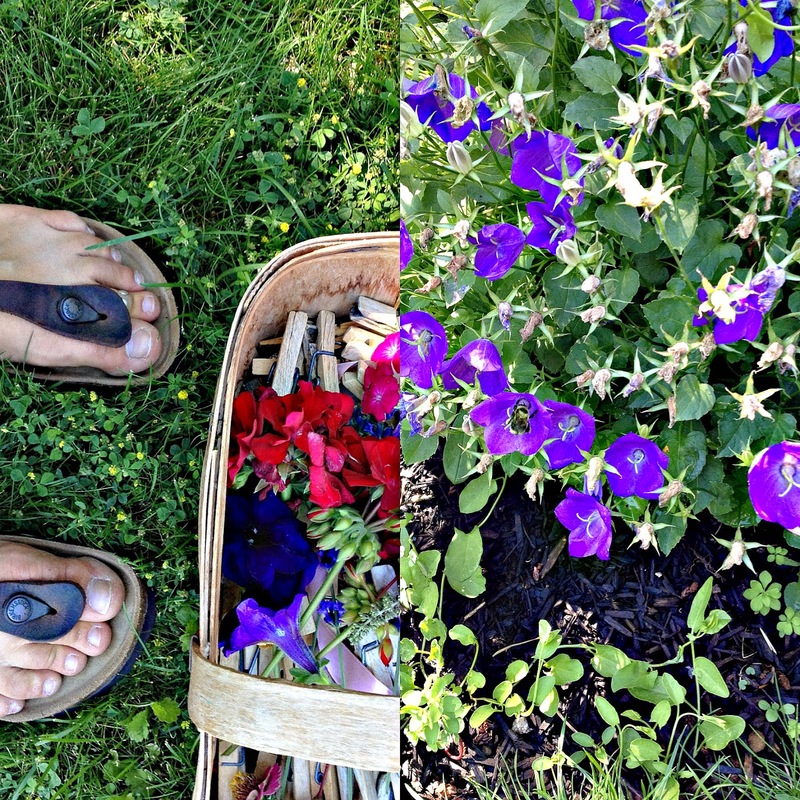 If there is one thing I have learned about my kids it's that they like picking flowers and smashing things with rocks- simple truth here folks- I'm raising highly evolved beings. As brutal as the delivery sounds the results yielded are quite pretty and ephemeral. 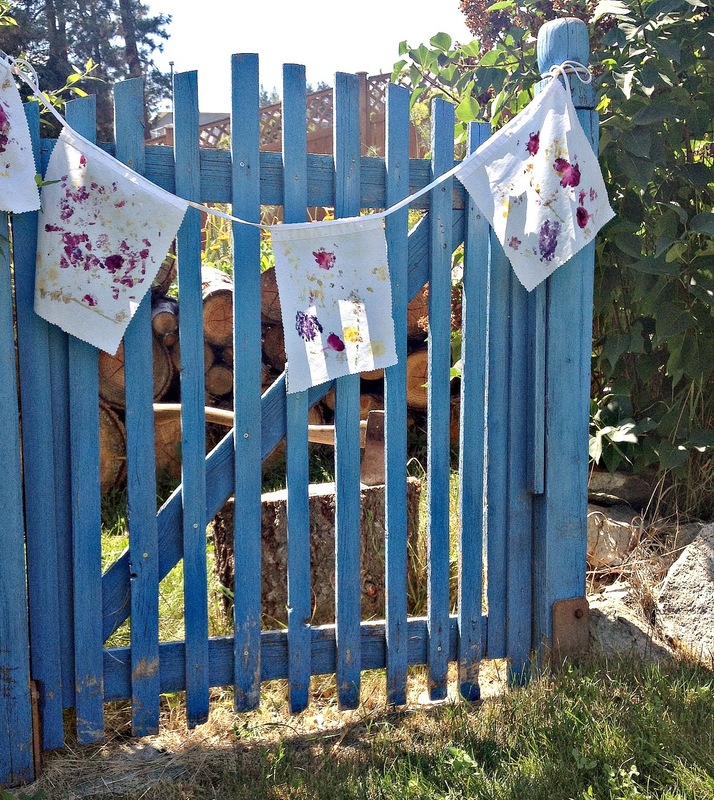 These simple Eco-printed flags look great outside as a garden accent or brought indoors as a reminder of sunnier days! To start this project you will need to gather a variety of deeply hued flowers- we found geraniums worked very well as did lavender and petunias. Cut squares of fabric for your flags- I used pinking shears to give a decorative zig zag cut on the edge of the fabric- make your squares about 8"x 10"- they can always be trimmed down later. Find a rock that feels good in your hand for the smashing. Lay your fabric out on a hard surface- we worked on a board that had a bit of give to it- place your gathered flowers out- I tried to do a bit of a design- the Littles were completely random in their placement. 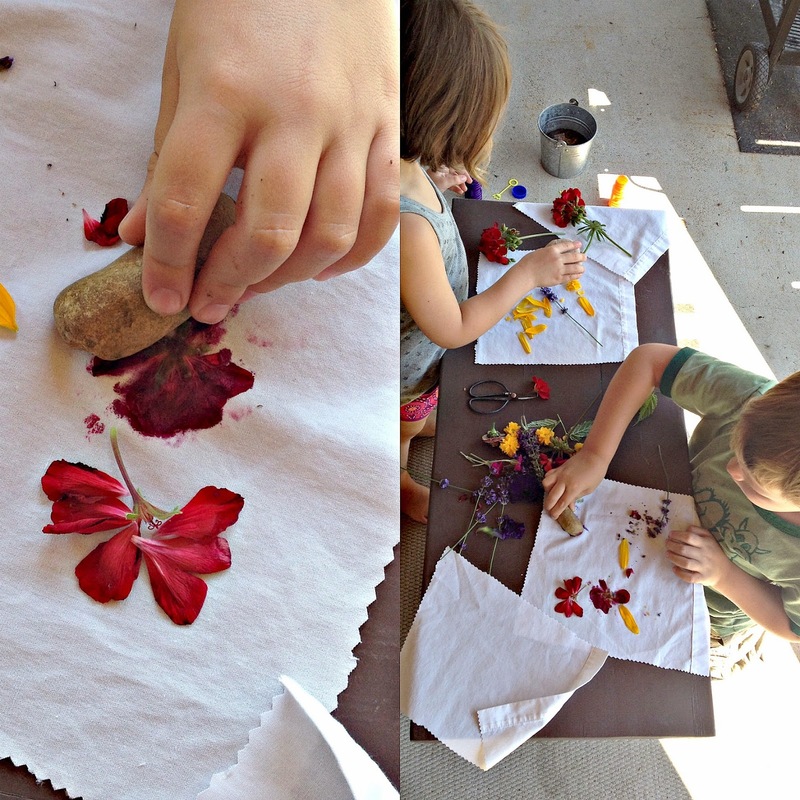 One option is to just take the rock and start gently mashing the flowers into the fabric- another way is to place a second piece of fabric over the flowers and hammer on that. 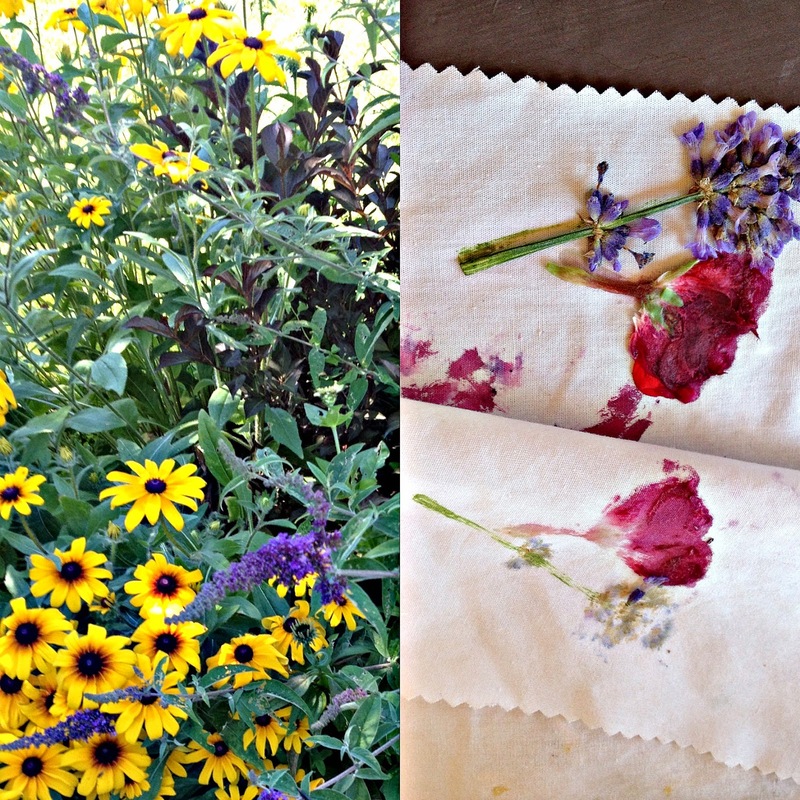 Gently pound or mash the flowers until they start to bleed into the fabric- the flower's pigment will stain the fabric. Carefully peel away the ponded flower remains. Set your fabric aside to dry completely- I put ours in the sun to heat set but you can also iron to heat set. You can use the fabric for a multitude of projects- unique throw cushions, tote bags or as we did a festive bunting for the garden. To make the bunting simply take your printed fabric and sew onto a piece of webbing- a simple straight stitch on a machine will do but so will hand stitching, stapling or hot glue! 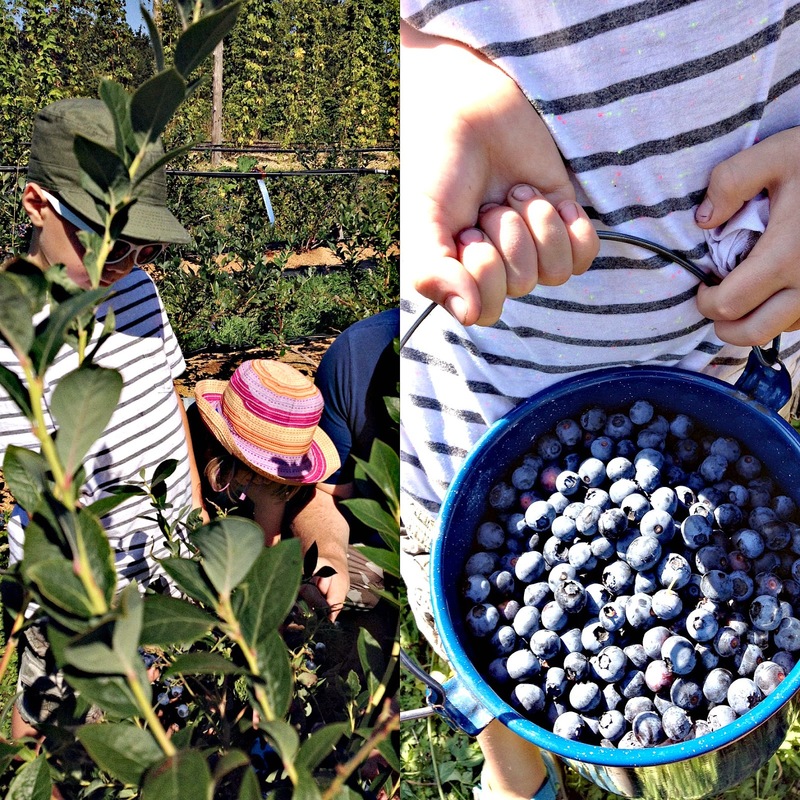 What I loved about this little project is that the Littles were able to engage in something similar to the eco bundling I did a few weeks ago- they were ever so curious and so this enabled them to be a part of that process. 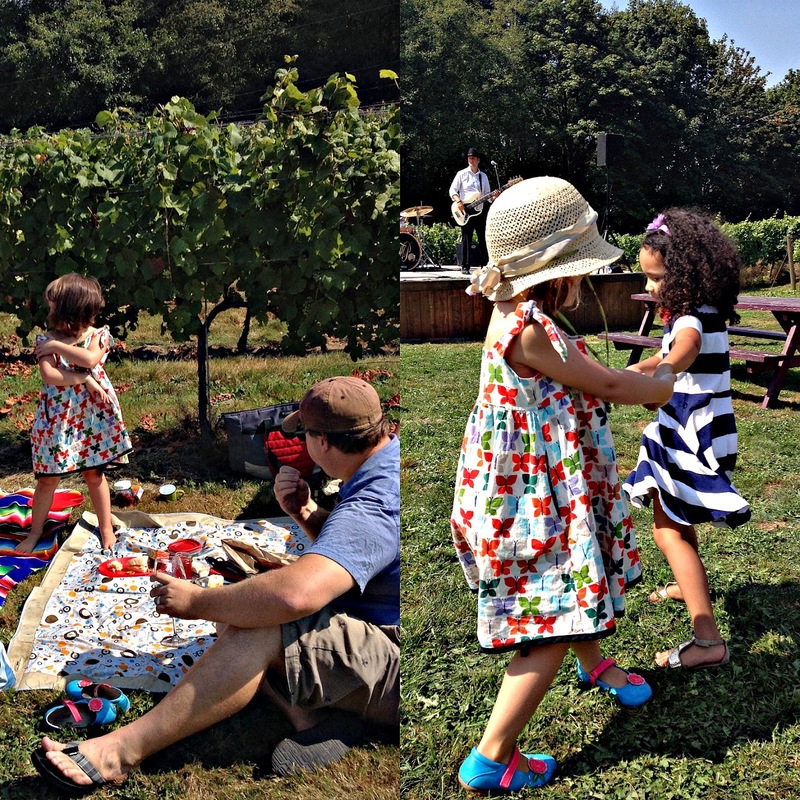 Working along side my Littles is so fun- nothing like an afternoon spent out in the garden at Mommo and Poppa's! Friends it is Friday again and the long weekend- we are halfway through summer holiday already! Hard to believe but true- we have some heavy duty plans that include hitting the beach and hitting the beach! Happy Pride Vancouver and Happy Friday Friends!